It may be icy outside, but in the new year, a gardener's thoughts turn to propagation. It's too early to start lots of things, because, although I could easily get them to germinate in a heated propagator, I haven't got enough windowsills to stop all the young seedlings going bendy through lack of light. The urge to nurture and poke about in compost is growing daily, though, and I have been casting about for something which I can germinate so early in the year. I know I could get chillies or aubergines going, or any of the other things which take an age to mature, before they begin to produce something edible, but I can't get very excited about them. I want to try something exciting. 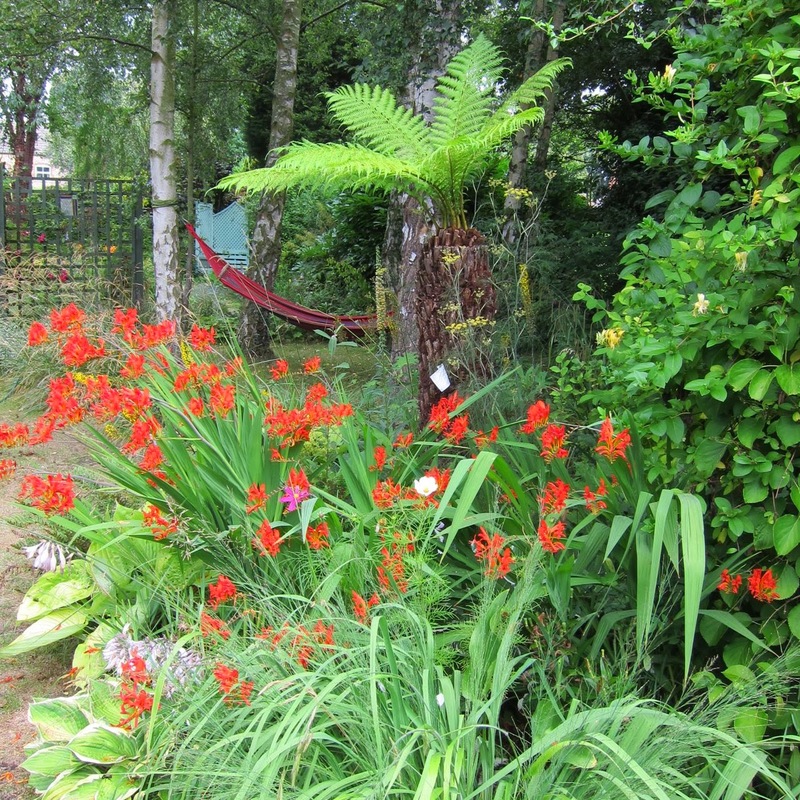 For some reason which I am now quite unable to remember, we decided to open our garden for the NGS (Yellow Book) scheme again, in June this year. I am already filled with a growing sense of terror, and in my head, the clock has already started counting down to 11am, 21st June, when we open the gates. I feel an urgent need to grow something large, impressive and easy to fill all the big gaps in one fell swoop. Initially, growing banana plants from seeds seemed to tick all the boxes. My thinking was that they would benefit from being started early, and, once germinated, they would all fit comfortably on the window sill. Once the cold weather is behind us, they could move out to the greenhouse, before being planted out in the garden at the beginning of June. I was hoping that by that time, the banana plants would be a fair size and make an impact in the garden. That was the theory, but things may prove very different in reality . 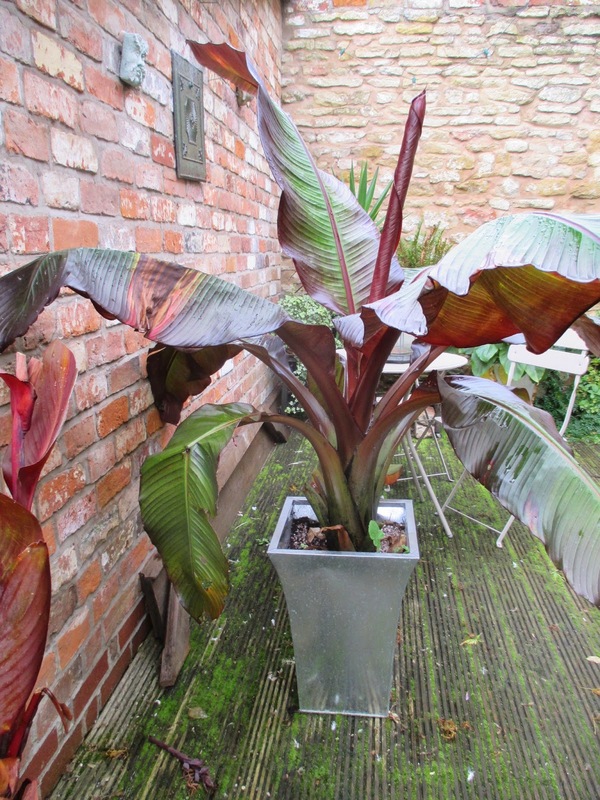 We already have some largish banana plants which we are overwintering in the conservatory, and so far, they are coping well with the conditions. We give them some heat when temperatures drop outside, and we keep them almost dry. They are wonderful plants in the sub tropical garden and add to the lush feel of the foliage, due to their massive leaves. Everyone says that banana plants grow extremely rapidly, but, to be honest, ours have shown quite steady growth so far. 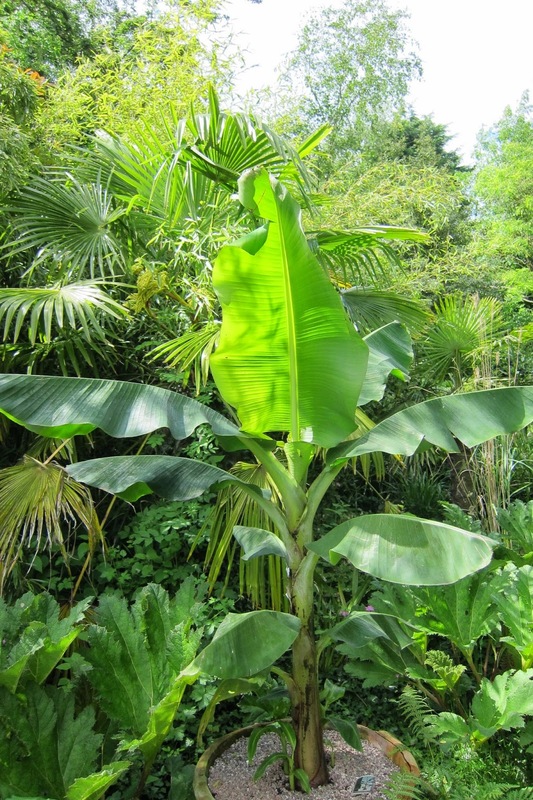 We have Musa Basjoo, which is, I believe, the banana of choice for most uk gardens. It is relatively hardy, as the stem is hardy down to minus 6 degrees, whilst the root can survive to minus fifteen (with a heavy mulch) so that even if all top growth is killed off by frost, the root will survive and put out new growth in the spring. 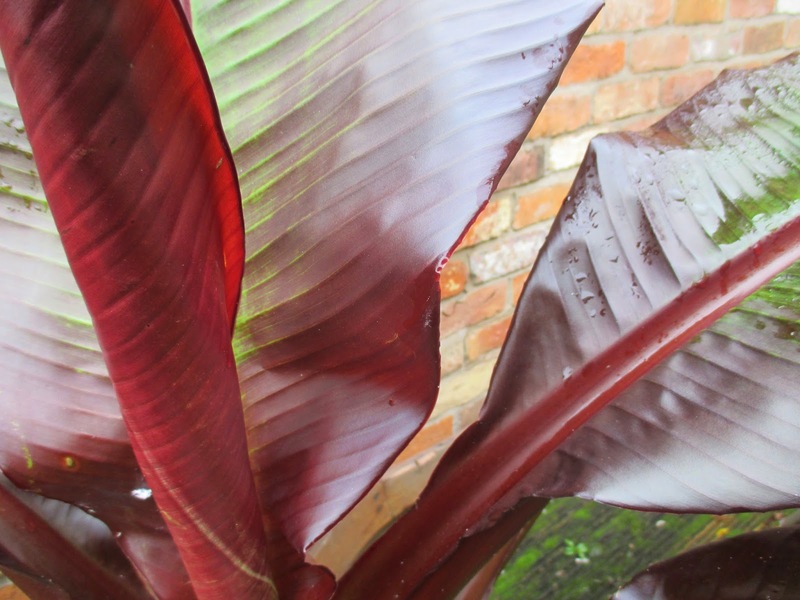 We also have Ensete Maurelii, which has gorgeous red leaves, but is not very hardy so needs a little coddling through the colder months. I have attempted to grow banana seeds before, but with little success. I do have a dim memory of one seed germinating, but it died off quite quickly and never really got established. So, although growing banana plants from seed is not exactly a new experience, it is a challenge, which, in truth , is more exacting than I first thought. Blogs are a fantastic source of shared knowledge and expertise, and I am constantly learning as I hop around the globe from blog to blog but Facebook is just as useful, and it is far too easy to dismiss it as just a social media site. I have been a member of the 'Hardy Tropicals uk' Facebook page for quite a while now, but have been as quiet as a little mouse, just reading and learning from the posts. 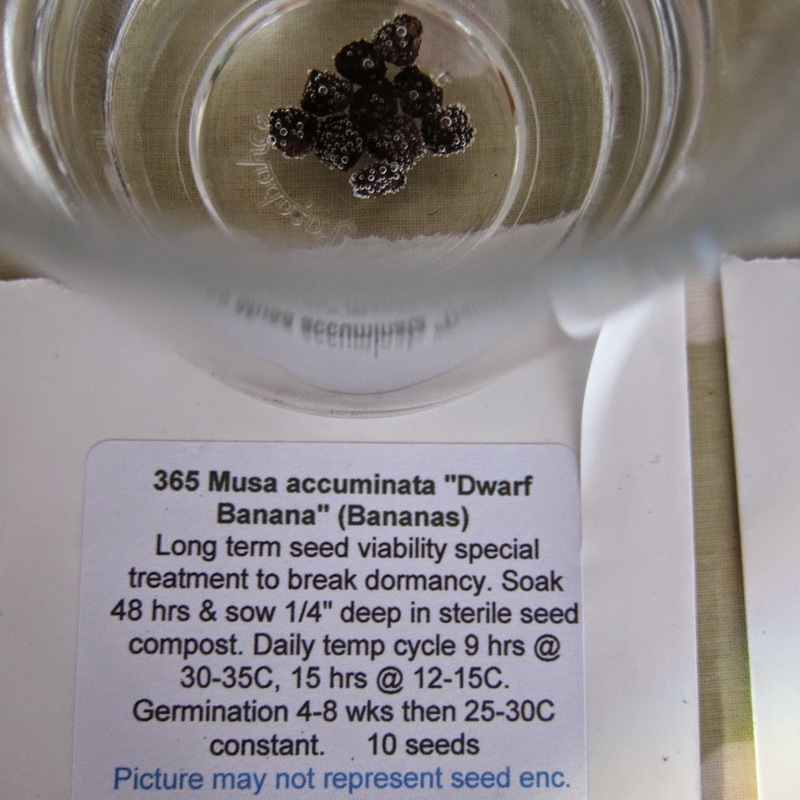 I decided, however, to enlist the advice of its members about the best bananas to grow from seed, and they did not disappoint! My initial thought was to grow Musa Basjoo from seed, but the lovely people on 'Hardy Tropicals' told me that this is not possible, as propagation is from the pups which the mother plant puts out. Someone advised me to get Basjoo as small/ plug plants instead, as germination of banana seeds can be difficult, slow and erratic. The wisdom is that pups are cheap and will grow on quickly and strongly, whilst seeds may still be sitting, ungerminated, in the seed tray for several months. I took this sensible advice on board and began to look around for some pups. So, where do you go when you want something cheap and fast - why ebay of course! 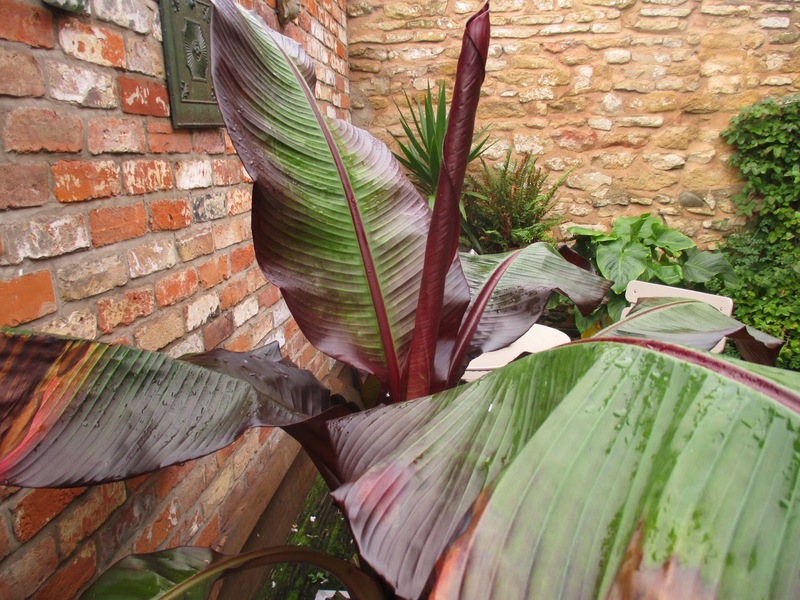 There were several sellers selling Musa Basjoo, and I chose one who had excellent feedback and low prices.Three plants for £13.50. What could be better ? Actually, four plants for the same price is even better. The button next to 'Buy it now' was entitled 'make me an offer' so I did, and the seller kindly agreed to pop in an extra plant for free. Below is a selection of the seller's plants. Other good advice from the members of 'Hardy Tropicals' was to fluctuate the temperature of banana seeds to encourage germination, which is something I know I omitted when I attempted to grow them before, and I will follow the advice to try 30 degrees daytime, and room temperature at night time. It can take anything from a couple of weeks to several months for germination to occur. 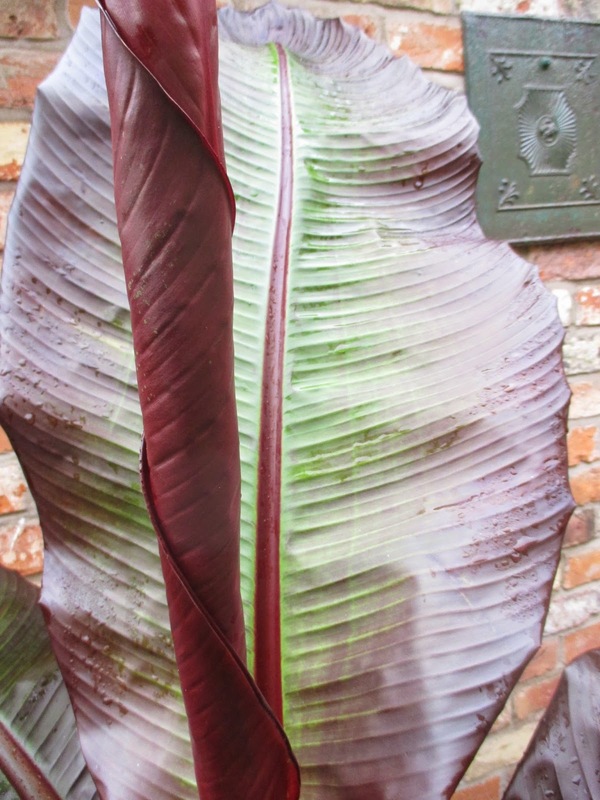 Members also recommended Musa Sikkimensis, which apparently is almost as hardy as Basjoo and with tougher leaves, and also Musa Helen's Hybrid. Ensete ventricosum is said to grow very fast from seed, but can be difficult to germinate. I like the idea of growing mixed varieties, and, if I do get any to germinate, it will be interesting to compare rates of growth, leaf size etc. 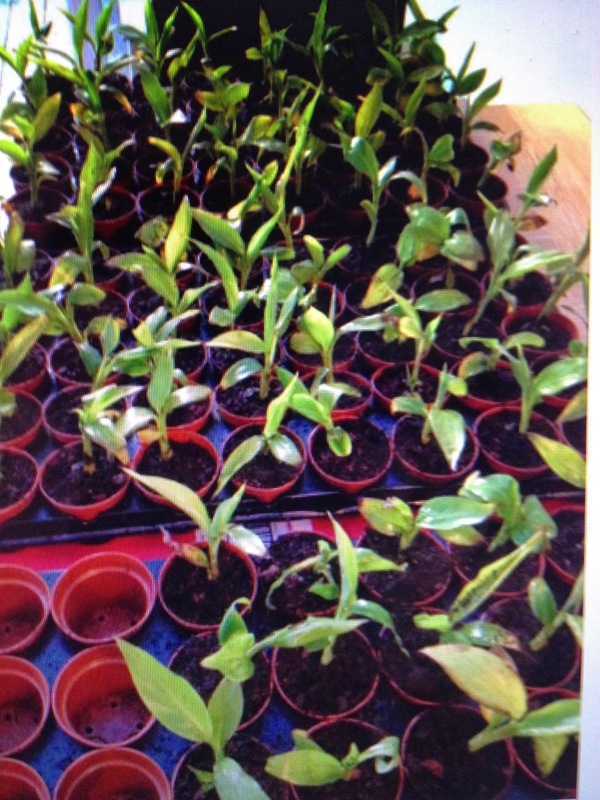 Above is a photo from 2013, showing one of my previous attempts to grow banana plants from seed. The detailed , precise instructions should have tipped me the wink that germination was never going to be easy! For some reason, I decided not to follow any of this good advice and did things my own way, and guess what ... nothing happened! From my own experience, and from the experience of knowledgeable others, it seems that banana from seed can be difficult. Not impossible but, well, let's say challenging. I like a challenge, and this time I'll do it properly and follow all instructions to the letter. If they fail to germinate, or, take a long time to germinate, then I will have those four little plants to lavish with tlc, so that they quickly turn into large plants. Hopefully, one way or another, I will have some new, high impact plants filling those naughty gaps for the open garden day. So, now I am poised - waiting for my seeds and my plants to arrive. Waiting to switch that propagator on, which, like the official switching on of the Christmas lights, will signify the official start of a brand new growing season. Oh, I'm excited for you Jane. Sounds like you are going to have fun (and maybe a wee bit despair) getting your plants and seeds to come on in time for your opening. Goes without saying that I wish you luck and a high germination rate. Hi Angie , I predict there will be highs and there will be lows - probably mainly lows !! I'm sure your sil would love a nice big plant to remind her of her family home. What an ambitious gardener you are! Banana plants from seed was the last thing on my mind when I had my garden on tour! Good luck! I can't wait to hear how this experiment will end! "Sense of terror" is the right choice of words for a upcoming garden tour! Hi Daniela some may say ambitious ... others may say foolish! Only time will tell! Dear Jane, how exciting that you have decided to grow your own bananas from seeds! I actually have grown an Abyssinian Banana from a seed in my youth and truly enjoyed the experience. Wishing you good luck and I am curious to hear how the experiment will turn out. If all goes wrong at least you have your four "pup bananas". Kudos to you for being brave and opening your garden to the public in June. I think, having some bananas at hand to fill some potential gaps is an excellent and hopefully stress relieving idea ;-). Hi Christina, so you have actually germinated a banana seed - so it can be done ! I will try to do it properly this time and follow the very precise instructions give by the supplier, this time. You have more patience than I have, growing bananas from seed, good for you! Your little pups look very healthy so I hope that they will look wonderful by June. We used to open our garden for the NGS, I know what you are going through at the moment! Hi Pauline, did you find NGS opening stressful ? We have done it once before and felt that the garden bits were enjoyable but the tea and cakes were a nightmare! We are hoping those will be done on another site this time. How exciting, I've never grown anything tropical before so I look forward to seeing how you get on. Good luck with your open day, it must involve a lot of work making sure that your garden is just how you want it for the big day. Hi Jo, it is a fabulous motivator to get all outstanding work done ! We were out till 10pm last time , weeding in the dark ! Our Musa Basjoo is over wintering in a large pot in the cold greenhouse. It's survived the last couple of winters outside without protection - well the root has! Best of luck growing from seed. 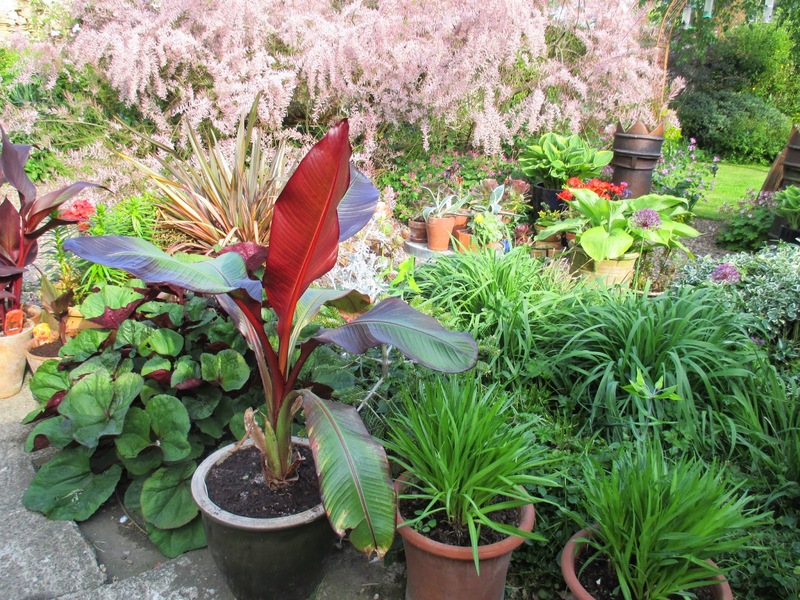 I love those red leaved bananas and we've tried a couple in the past but not managed to get them through winter. You might have tempted me into having another go but maybe not from seed. Hi Martin, that's interesting, so you have overwintered your Basjoo outside ! Very brave. 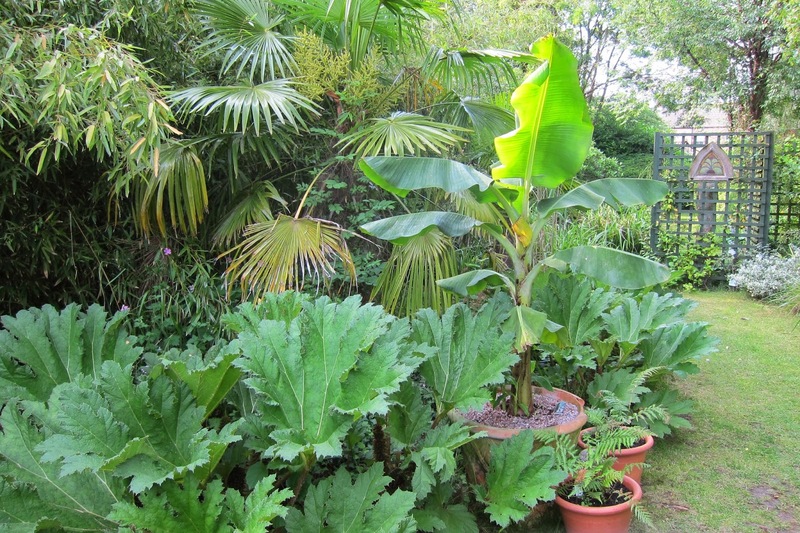 We are sharing our conservatory with many large (and spiky) plants including 2 or 3 bananas. It would be a relief if they were taking their chance outside where possible, but having lost so much tender stuff we are cosseting these guys! What a hopeful post! I'm impressed with your knowledge about banana plants. I think they're lovely! And they'll be a beautiful addition for the garden tour. Your potted plant collections/mixed foliage photos are pleasing to the eye. Hi Plantposting and thank you for comments. I am a real banana beginner, but am on a fairly steep learning curve. I just hope I have the patience for the long wait to germination! I did try growing bananas from seed once but without any success. I have just read your comment on Angie' s post about buying some winter aconites. If you send me your address I will send you some. Hi Chloris, that is so kind. Thank you so much. I will send you my address and also send you something in return - I have some young auriculas( including some farinas) and some Rosa 'garden Party' rooted cuttings (min rose about 40cm tall, single pink flowered) if those take your fancy ? Ooo, lovely, thank you Jane. I would love them.How nice to be able to swap treasures. I'm going to a presentation on growing sub tropicals in our area. I hope it includes bananas. The speaker is a rather divine young man, very Pan like. I would give anything, well a considerable amount, to be able to come to your garden. Hi Susan, than you for your kind comments. If I was near enough to you, I would love to hear the talk given by your Pan like man! Really interesting stuff Jane although I make no attempt to grow anything as remotely exotic as your bananas here, it just wouldn't work. At the other end of the scale I share the same sense of challenge getting certain Primula and Meconopsis seeds to germinate and grow to maturity, it doesn't have to be a tropical plant to be difficult. I wish you all the very best with the NGS opening, you are far braver than I am, although I excuse myself by saying I am a plantsman rather than a gardener, which means that most of the garden is a tip! Hi Rick, I agree that any plant can be a challenge to germinate. I really struggle to germinate some common hardy perennials from seed. I do enjoy trying though! Even keeping Meconopsis ALIVE is a huge challenge for me! I am at the stage with the NGS garden opening when I can't remember whatever possessed us to do it ! I know I will enjoy the day when all the work is done, but the amount of work is daunting at the moment! I can't wait to see the progress on your banana plants! Your grounds are so lovely and will look like Eden in June. People will love walking though it. Flower Freak, you are too kind! Oooh, that’s brave – and exciting! I suppose you are growing the seeds in a thermostat regulated propagator? Otherwise it would be a nightmare to control the temperature? I look forward to seeing your seedlings! Hi Helene, yes, I have 2 heated propagators which I couldn't do without - one is ancient but still obediently coughs into service every year, and the other is a shiny new one, the size of Australia! Untried as yet! I had no idea you could grow a banana from seed! They seem difficult to me since I have no experience with tropicals. Good luck! Anyone who tours your garden this June is lucky, indeed. Hi Tammy, the theory is that bans grow from seed, but whether I can actually get one to germinate is entirely another matter! Thank you for your kind comments on the garden! This sounds like a great project for mid-winter blues. Isn't the internet such a fantastic tool? I think I've learned just as much about gardening from online sources as I ever did from books or working with other people. It amazes me some days all the knowledge we now have at our fingertips. Good luck with your bananas!